With all the planning and time it takes to execute the perfect Thanksgiving meal, it makes sense that the table setting could get pushed to the back burner. However, creating a festive and beautiful table is easier than you think. Here are some tips and tricks to create a beautiful table setting this Thanksgiving that is quick, easy and effortlessly stunning. When setting your table, mix and match the texture and design of your plates and bowls for a unique and personal touch. Try combining plates with different patterns but make sure to keep them in the same color profile. You want the table to look organic but not messy. For my table setting, I kept it simple with white plates but I added a salad plate with a dot design on the boarder to add depth and texture. This is an easy way to add personal details to your Thanksgiving dinner with items you already have. Go the extra mile and create your own name cards for each guest. Making your own name cards doesn’t have to be expensive or time consuming. Use what you already have laying around your house. For example, I used white card stock, a permanent marker and some fresh thyme to create festive name cards. The cards are simple to make, plus I only used items I already had in my apartment. 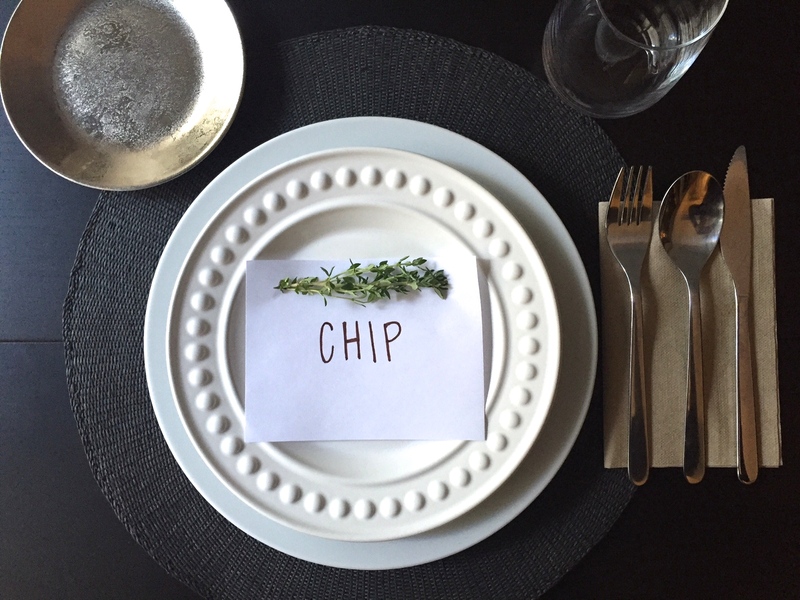 Get creative and make your own personal touches on your Thanksgiving table. A little sparkle and glitter is always appropriate during the holidays. So why not add some to your Thanksgiving table setting? I used a sparkly bread plate to add a touch of glamour. It was a great balance with the black wood table and brown paper napkins. Don’t be afraid to add a sparkly touch this Thanksgiving to make your table look effortlessly chic. If you need some additional tips for a perfectly moist Thanksgiving bird, check out the CC&BT recipe for a Turkey Brine here. Happy Thanksgiving from Coffee, Cabs and Bar Tabs!